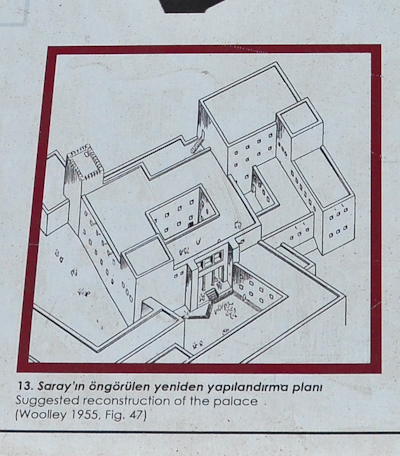 Detailed view of the entrance to the Level IV Palace that was excavated by Sir Leonard Woolley. It was in use from 1500–1400 B.C. Note the staircase and the two column bases that led to the "porch" of the palace. In one of the rooms of the palace Woolley found a large cuneiform archive. In a more recent version of the palace he found the statue of Idrimi who ruled from this Level IV Palace. In the upper right portion of the image note the covering over some of the rooms of the place that were made out of stone and mud brick.